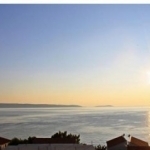 Modern and fully furnished apartments are located in a quiet part of the island of Ciovo, in the beautiful bay of Mavarštica. The property is located 60 meters from the sea and 5 minutes by walk from local shops, restaurants and bars. The historic town of Trogir is located 4, 8 km from the apartments. If you choose to visit Trogir or Split nearby there is a boat that runs regularly to Trogir and Split. The apartments are fully equipped, with kitchen, private bathroom, air conditioning, wi-fi internet, balcony with beautiful sea view. Evening resting in the bay is an ideal holiday choice. An advance payment of 20% is required to confirm the reservation. The rest of the guest pays upon arrival. The time of guest arrival is mostly from 14 o'clock although we try to make the apartment as needed and ready earlier. Departure from the apartment is until 10 am. We welcome our guests with a welcome drink and try to prepare some homemade pastries for you. Apartments Dirsi listing has been viewed 1466 times since 11.02.2019.